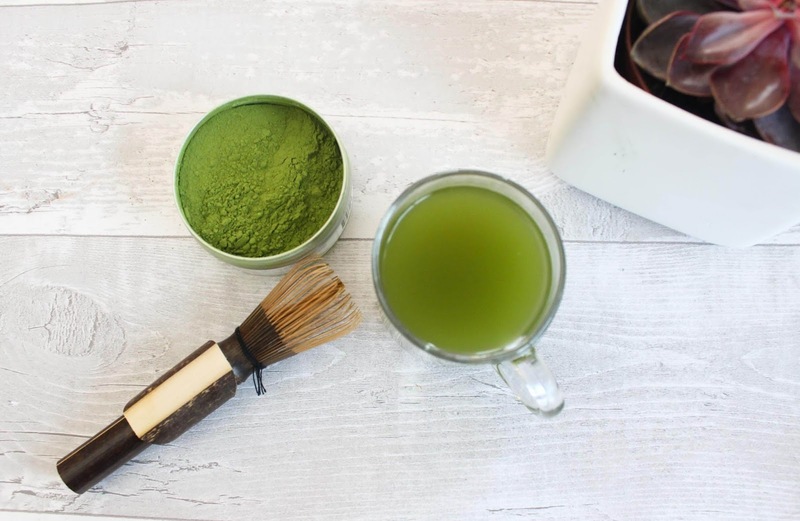 I heard about Matcha green tea a couple of years ago, it was the latest health trend which came around shortly after bulletproof coffee. 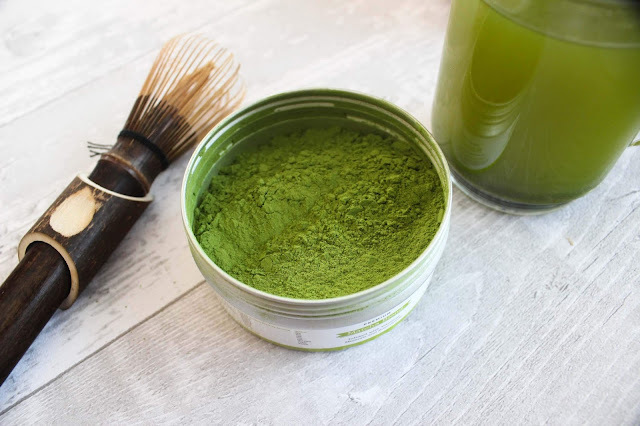 Even though matcha green tea has only been widely available in the UK for a couple of years, drinking it is actually a very long standing tradition in Japanese culture. So what is Matcha green tea I hear you ask. It's the finest quality green tea, which has been steamed and then ground into a very fine powder. In particular its loaded with Loaded with Catechin, EGCg which is widely recognised for its cancer fighting properties. Matcha Green tea has 100 times the amount of ECGg as any other tea. 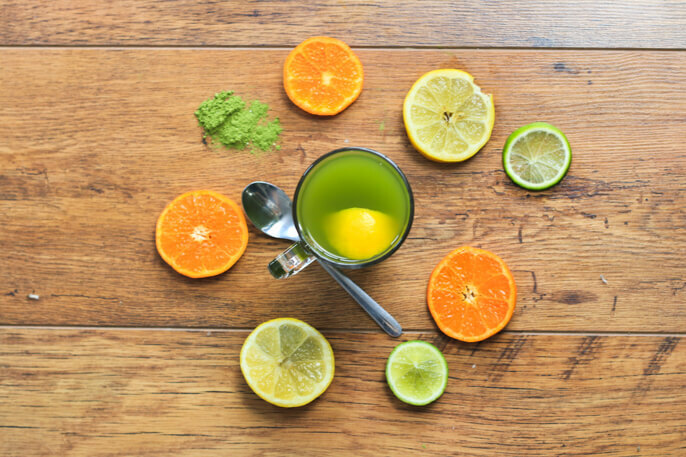 Matcha tea is rich in vitamins and minerals in particular in vitamin A & C, Iron and potassium. According to the internet Japanese budhist monks have used Matcha green tea as a means to help them meditate and relax whilst staying alert. Matcha tea contains an amino acid L-Theanine which helps the feeling of relaxation without the drowsiness. Matcha tea is known to help boost your normal metabolism by up to four times by drinking a cup of tea. This is fabulous news for anyone wanting to lose a few extra pounds as it will make you use up your food calories much more efficiently. Matcha tea naturally contains caffeine, however, because of the L-Theanine the caffeine is absorved very differently by the body then lets say caffeine from coffee. You won't crash after a cup of Matcha tea and won't get the jittery feeling that coffee caffeine can sometimes give you either (if I have too much coffee I turn into a jittery ball of anxiousness). I have previously bought some Matcha green tea on the internet and can definitely say that after drinking it I felt energized and alert. I drank it every morning for a month but then I didn't rush to buy it again. Why? Because it just didn't taste very good. I knew it was good for me, but the flavour put me off, it wasn't unbearable but it also wasn't very pleasant. The tea I had tasted quite bitter and very strong, even if I just used half a teaspoon. I can't remember the name of it, it wasn't a big brand, just some independent supplier I found on Amazon. Because of all the health benefits, however I was willing to try some other Matcha Green tea. This time I've tried Dream Matcha*. I honestly love it! It tastes so much nicer than my previous tea. There's no bitterness and the flavour is much more gentle, I'm actually enjoying drinking it rather than forcing myself to down it in one. I'm actually writing this blog post at 6.30 am thanks to this wonder of a tea! 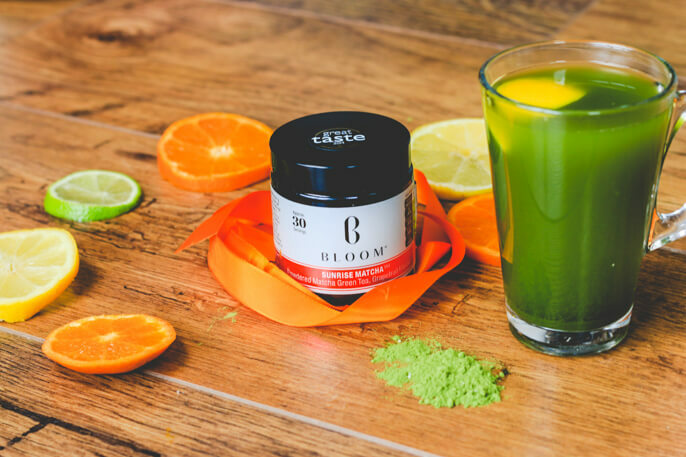 What's even better that on top of all the natural health benefits found in Matcha Green tea, the blend from Dream Matcha is actually infused with extra vitamins and minerals. 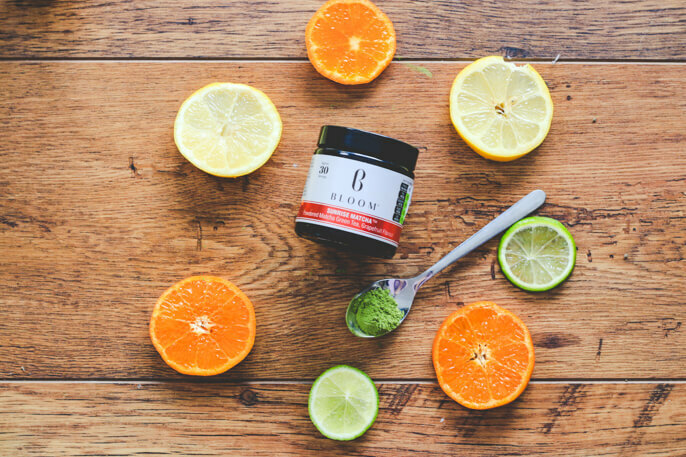 They've added things like : Organic banana extract, Vitamin B3, Vitamin B6, Organic Lacuma Powder, Organic Goji Berry Extract, Zinc Picolinate and Alpha Lipoic Acid. 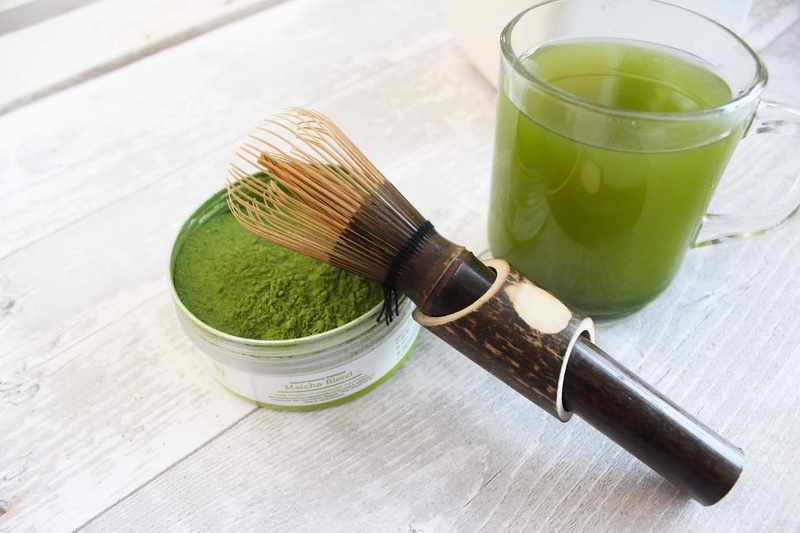 To make Matcha green tea you'll need a mini whisk, mixing with a spoon just doesn't seem to cut it! 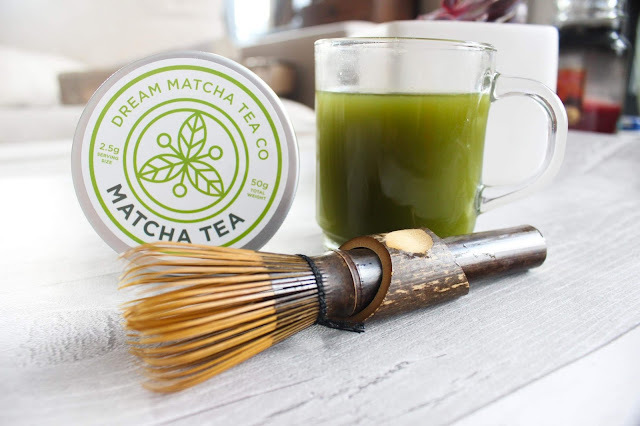 Dream Matcha sell this long stem bamboo whisk*, which works great, and I just love how it looks. They've got a great bundle deal where you can purchase the tea and the whisk together at a discounted price. Unfortunately, it seems that Dream Matcha website is no longer available but over the last year I have been experimenting with some other brands and below are my two new favourite additions! I discovered Bloom when I was trying to find some new Matcha green tea and their packaging really caught my eye, it's just beautiful! I love the little jars and the label, kudos goes out to their design team. I picked up a Tropical Matcha and Sunrise Matcha. 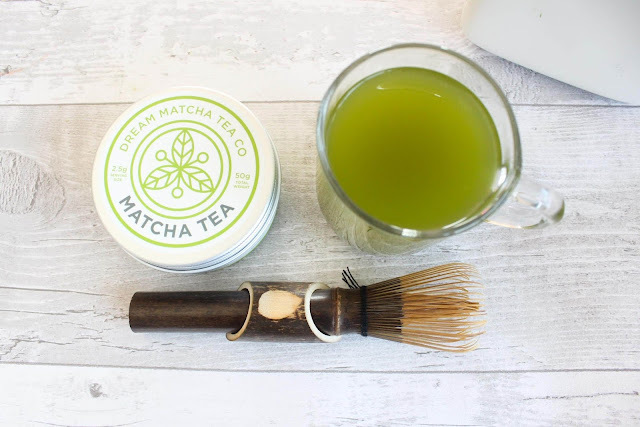 All of their matchas are organic Japanese matcha of ceremonial grade which is the highest quality of matcha green tea, used in traditional Japanese tea ceremony. 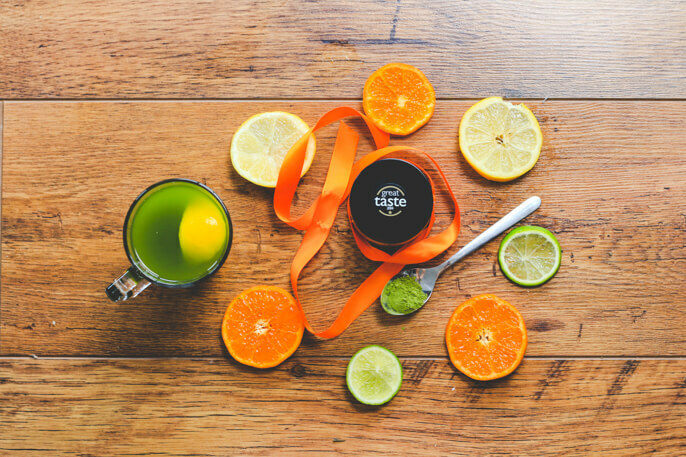 Sunrise Matcha is flavoured with a delicate but zesty grapefruit flavour and has even won the taste award! The Tropical Matcha is flavoured with mango and tastes exactly like the description suggests - tropical. Out of the two, I prefer sunrise matcha because the flavour of grapefruit is a little milder but the boy (who I introduced to Matcha green tea when coffee started making him ill) absolutely loves the Tropical one so I guess it's just personal preference. I absolutely love these teas and will definitely be trying more of the flavours, especially the Supercharge and the Mojito. 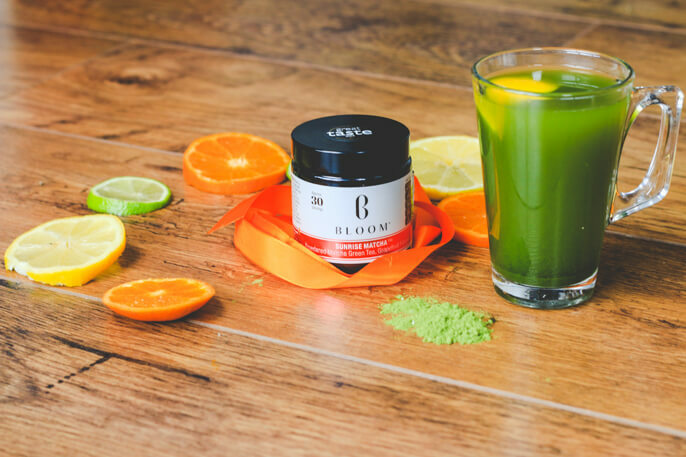 In fact I love them so much that I emailed the team and bloom and told them that I will be featuring them in my post so they kindly sent me another pot of sunrise matcha to ensure I had enough to get some photos. 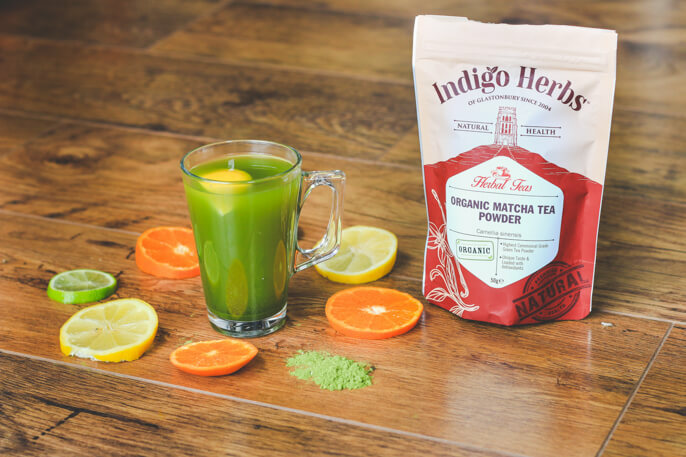 Another Matcha tea which I think tastes great is the Indigo Herbs Organic Matcha*, the lovely team at Indigo Herbs sent it for me to try and like everything I have tried from there before it hasn't disappointed. It's only £11.99 for 50g of tea which is so much cheaper than other places and the quality if fab. There aren't any additional flavours added to it so it tastes very earthy but not bitter like some lower quality matcha green teas I have tried. I love drinking this with a slice of lemon and a drizzle of honey. Since I originally wrote this post and I have even done so experimenting with using matcha green tea for baking! I created this delicious Matcha Green Tea GF Banana Bread recipe. *As always my opinion is 100% my own. Have you ever tried Matcha tea? What did you think? I'd love to try matcha tea although I was worried I wouldn't like the taste which is why I've put it off! I bit the bullet and tried a matcha latte for the first time the other day and it was actually surprisingly so nice! I have tried matcha which I got from Tea Pigs, I just ended up with chunks of it floating in the water. I think I need to invest in a mini whisk. I found that to be bitter and a couple of times, left me feeling nauseous!